I’m excited about two books right now. 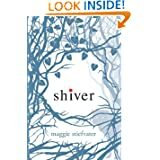 I am in love with SHIVER and I just finished it. That’s my fiction fun read. The other tidbit I’m reading is THE TRANCE OF SCARCITY. It’s quite an interesting nonfiction read. Once we’ve assigned a meaning…We then pass on our conclusions to our neighbors and children and students….then they too, treat the Story as though it’s the Truth. Now the Story may persist for centuries, generation after generation, as though chiseled into the side of a mountain.